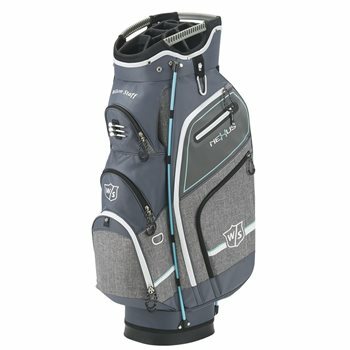 The lightweight Wilson Nexus III cart bag offers all of the features of a premium cart bag. The bag has a 14-Way top with individual full length dividers for organizing and protecting your clubs. The front putter well provides easy access for oversized grips and the top pass-through strap secures the bag onto a cart or trolley. The Nexus III is equipped with external tee, pen and divot tool sleeves, two umbrella holders, a Velcro glove patch, a large towel ring, a rain hood and nine pockets. Pockets included are two large garment, two front accessories, one large insulated and 4 external, which include 2 velour pockets.